This image shows the river that forms the southern boundary of the Karaginsky District on the Kamchatka Peninsula with the Ust-Kamchatsky District, just above the point where the river reaches the Pacific Ocean. It’s both a mighty stream and a little nothing rivulet, depending on the scale you’re considering. 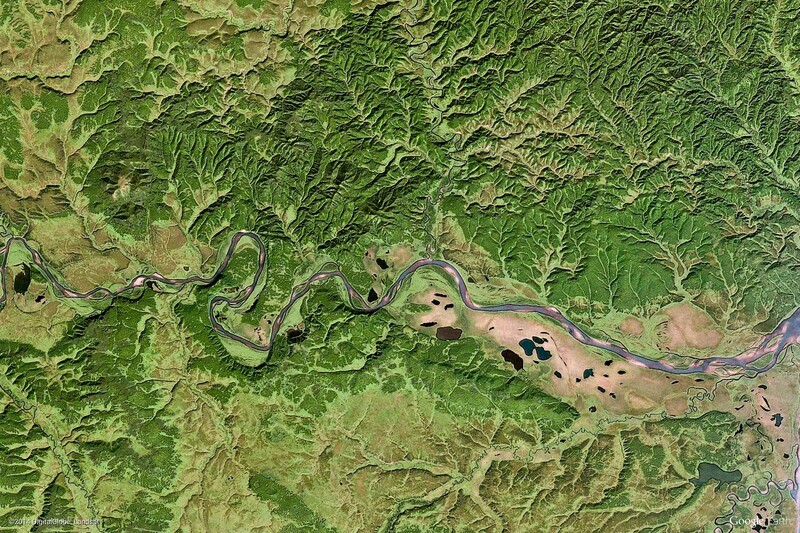 The river is flowing from the spine of the peninsula, the Sredinny Range, to the Ozernoi Gulf of the Bering Sea. First, you see the meanders, which suggest a wide floodplain where the river has plenty of space to comfortably make its bed in the spring when snowmelt fills it with roaring torrents. That means a flat area of soft soil, alluvium dropped over aeons. You notice lots of dark puddles and pale green zones, a chain of little lateral lakes and bogs, in the final delta area. Then you look around a bit and you realize that there are a multitude of smaller streams flowing towards the river like blood vessels or veins in a leaf. Each of them creates smaller meanders in its own little floodplain of soft green, nested in the sharper terrain of lush dark green hills. From all these peaks the water flows to the lower areas and gathers as countless streams that converge to run towards the sea. This beautiful example of hydrography meets the equally exciting forces of geology and vulcanology — earth and fire — since the Kamchatka Peninsula sits along the edge of the great Pacific Ring of Fire. All too often, cartographers of worlds of fiction create their maps by scattering mountains haphazardly and then drawing random squiggles for rivers. A striking example was the original map of Theah, the setting for 7th Sea (Alderac Entertainment Group, 1999). Compare with the redesign for the second edition (John Wick Presents, 2016). The landscape is not arbitrary; it works as a connected whole, with simple but powerful rules. If you intend to make a map that represents the actual terrain of your setting, it’s crucial to think of it this way and to consider how the water flows onto and across the land. That’s not to say that should be the only type of map provided; the first edition version of Theah, for example, could be argued to represent the general state of knowledge of characters in that setting and at a certain time, rather than representing the land accurately. If you produce or use this sort of map, then it can mean that the characters will encounter surprises when they travel other than wandering monsters. Maybe they are desperately looking for the Eastern Passage, or a mysterious island, or a safe bay to drop anchor in during the storm: not finding their goal because the map is inaccurate, but hoping it is a good enough approximation that they can reach safety in time. To be truly useful, the map should have an impact on the adventures. Otherwise it’s just a page decoration, and all too often a mediocre one. Posted on June 8, 2017 June 16, 2017 by Sophie LagacéPosted in Art, fiction, gamesTagged art, games, maps, topography. Mapgasm! I looove maps – in my teens I would get sidetracked from the Great Fantasy Novel (TM) I was writing in order to make sure the maps were right. Geography isn’t a random thing and geography (hydrography especially) shapes civilisations, so I’m right there with you about not liking just plopping features down at random.